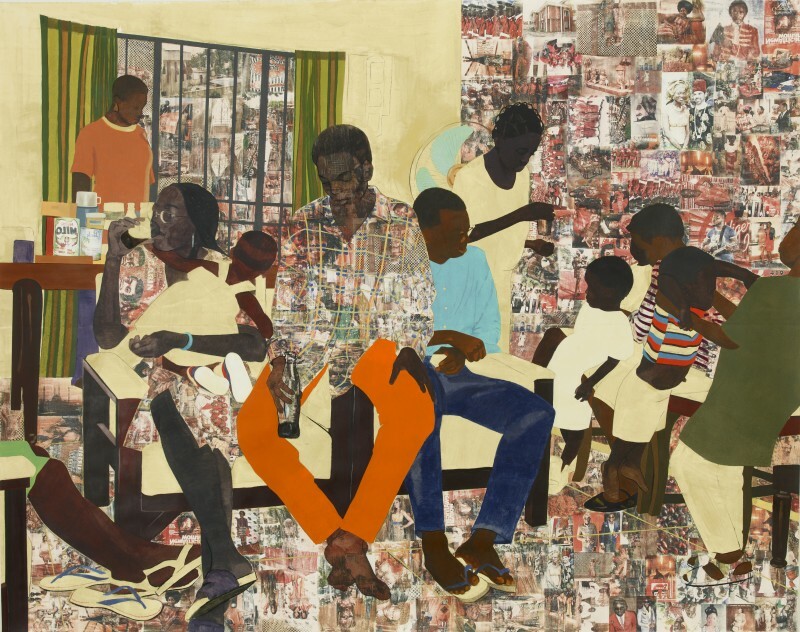 Nigerian born, U.S.-based artist Njideka Akunyili is fast becoming the art world’s newest star. 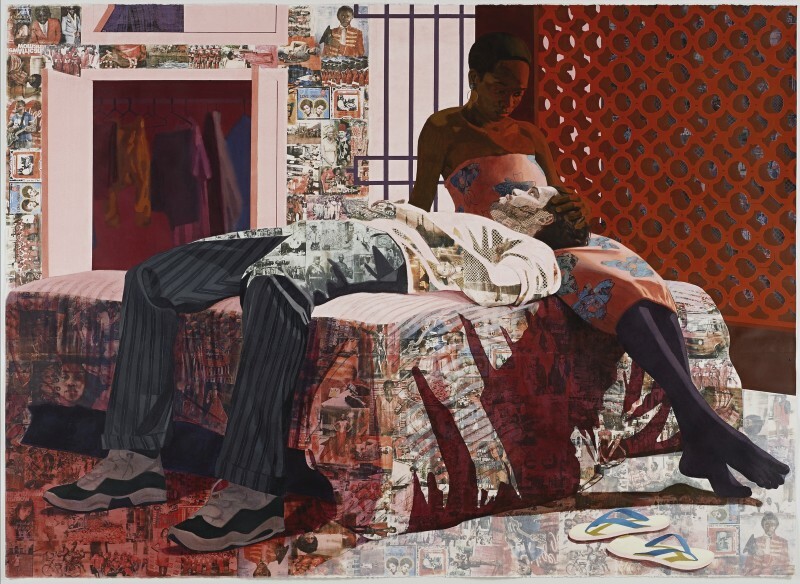 At last year’s Art Basel, five of her large figurative collage paintings sold out in just half an hour. 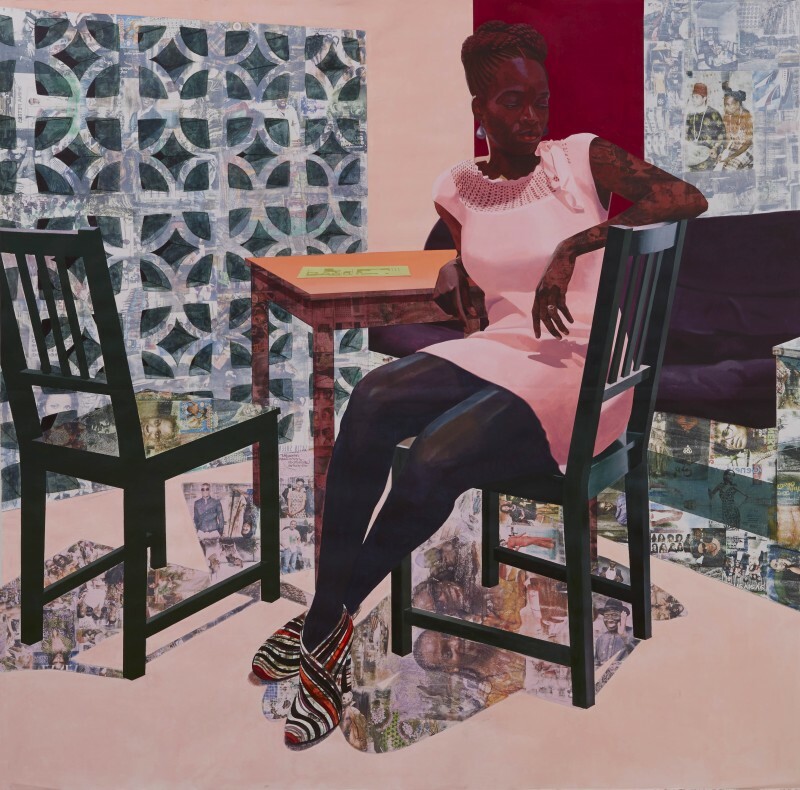 She was selected for the prestigious Studio Harlem residency program in 2011-2012 and is currently one of the three artists in its exhibition Primary Sources. Rumor has it that major collectors and museums are now vying for the works on show — an impressive feat for the recent Yale University MFA graduate. Here is an interview she gave last year about her art work (Courtesy: Arise Magazine). 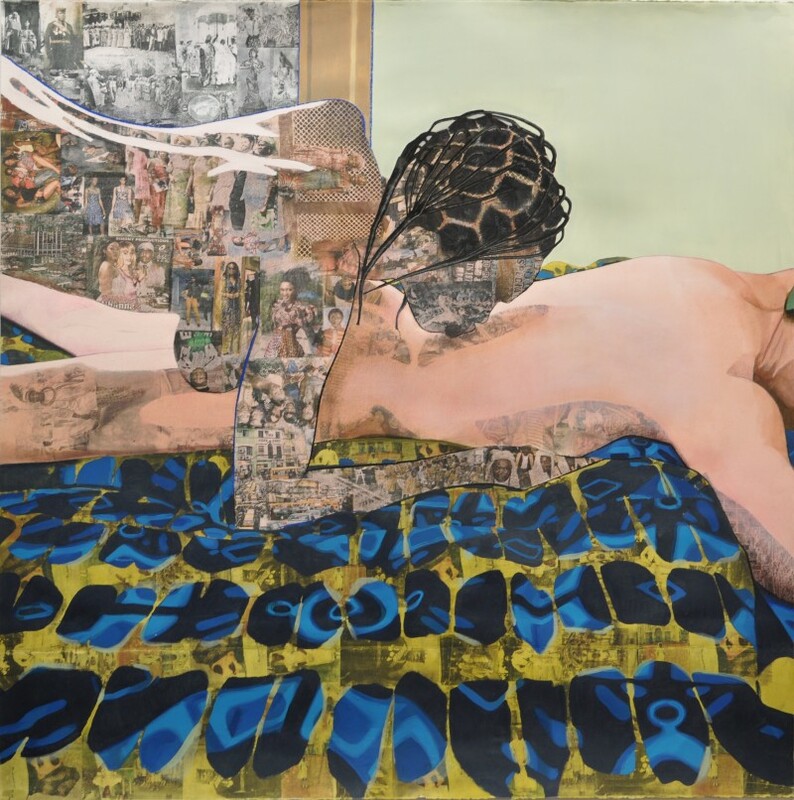 You recently showed a series of five large-scale collage paintings at Art Statements during Art Basel this year. How was your first art fair experience? It was exciting and overwhelming all at once. Basel is an incredible town and it was absolutely filled with art lovers — artists, curators, critics, collectors, dealers etc. There was a ton of great art on display and it was great to see it all — albeit exhausting. You once said “My art addresses my internal tension between my deep love for Nigeria, my country of birth, and my strong appreciation for Western culture?” Can you explain what you meant? The work deals with various themes but the overarching thread is that I’m availing myself of Western painting to seek out a new visual language. In my work disparate elements clash together to give rise to a distinctive yet cohesive whole. The sentence you mentioned refers to an interstitial space of negotiation that I work towards. This in-between/liminal space is referenced a lot in post-colonial discourse — Mary Louise Pratt calls it the ‘contact zone’ and Homi Bhabha calls it the ‘third space.’ This transcultural space of constant engagement and appropriation is what I was talking about. Your paintings combine numerous materials, blending acrylic, charcoal, pastel and pencil with intricate collages. How do you start? There is no one way I start my work. Sometimes I have a clear idea of the composition. I’ll make sketches, work out the study with ink drawings and plan out the colors in Photoshop. Other times I start with one small area of the drawing and let it grow, introducing various materials when the work needs them. You are a painter working primarily on paper. What made you lean towards this medium and not the canvas? I still do work on canvas but most of my work is on paper for various reasons — the foremost being that the soft highly absorbent quality of certain printmaking papers is great for transfers. I also like paper because of the delicacy to it. How long does it take you to create each collage painting? It takes about three to four weeks to finish each piece. I can do it in two weeks if I work 17-hour days. During your residency at Studio Harlem did you face any challenges in the lead up to the exhibition? The museum has been great and supports you in any way they can. The one limitation I had was that I had to scale down the size of my work because of the lower ceilings in the area where our works were displayed. Which artists would you say influenced you in developing your artistic practice? I look at a lot of painters’ painters like Piero, Titian, Velasquez, Manet, Degas and Balthus, also obscure artists like Hammershøi. For drawing inspiration I admire Holbein and more recently the Italian painter Bronzino because I like the sensuality he achieves with his surface using layers of glaze. I also love Kerry James Marshall, Wangechi Mutu, Malick Sidibé, Nontsikelelo Veleko and Yinka Shonibare. I feel a slight content overlap with the last four artists. Literature coming out of Nigeria and the African diaspora also played a part in the development of my work.